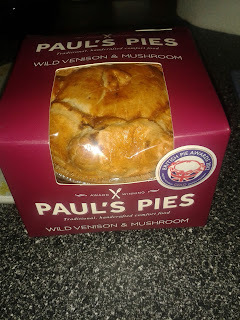 continue reading "We Try The Pie Before You Buy"
I am really glad to have had the opportunity to spend some time living in the Suffolk countryside. I grew up on a farm in Buckinghamshire and had always felt I was from the countryside. However in Suffolk the countryside is so much quieter, you can spend hours walking or cycling barely seeing another soul. 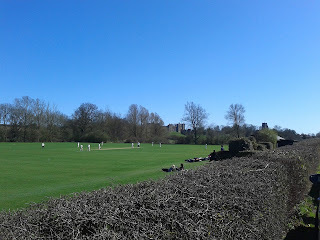 It was here that I feel I discovered the quintessence of English countryside. 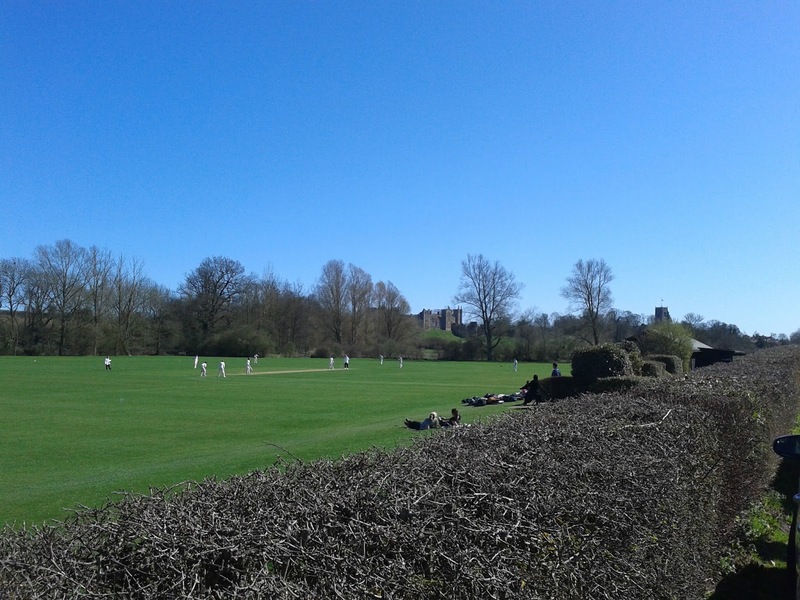 Thatched cottage, medieval villages, windmills, cricket matches outside the castle, Suffolk has everything I expected, but never really found, England to have. Suffolk was recently given an award which recognised how well it embodies Englishness. 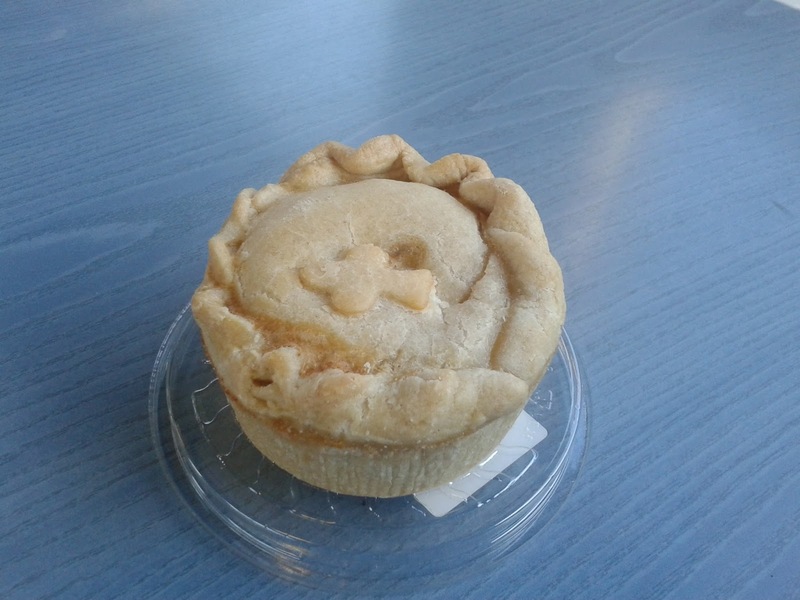 The Pie Kitchen from Bury St Edmunds received the best pie award at the British Pie Awards 2013. The Pie Kitchen are a small producer and this seems to be typical of Suffolk, there are many different small producers in butchers, bakeries and farm shops all making ‘craft pies’ which is great to see. 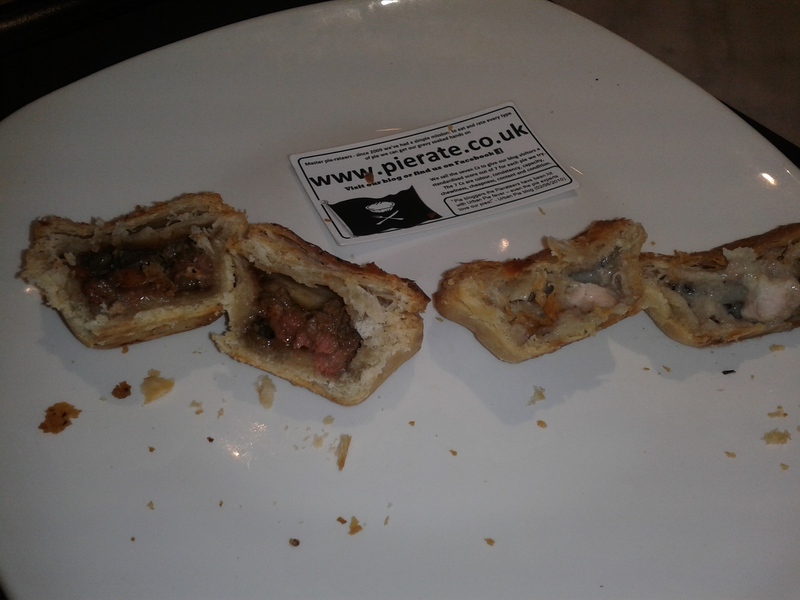 I have gathered a few of these pie reviews together to see which pie can win the title of Pierate Suffolk Pie Champion. Suffolk not only produce award winning pies they are also famous for fantastic beer. Broadside is brewed by Adnams to commemorate the battle of Sole Bay in 1672. It is one of my favourites so I was delighted to find a Steak & Adnams Broadside Ale pie made by Country Pies in a local farm shop. 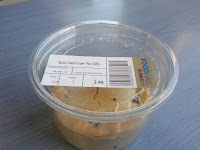 It weighed in at £2.75, the most expensive of these Suffolk pies. It was also one of the smallest, being a bit too shallow for my liking so it would have to do a lot to make up for being relatively bad value. This pie had the best Colour of any in this Suffolk review and a nice pastry cross on it. I liked to think this was an ‘X marks the spot’ for where to start digging for a pie filling to treasure. As I started to dig with my fork I found tender and tasty meat and the filling took up all the (relatively small) Capacity. However, the filling was just a little too bland to make up for this pie being so expensive. Such a shame as the Adnams ale should have left it bursting with flavour. I was pleased to find a traditional bakery in my local town of Saxmundham and even more pleased to find that they sold a range of pies. I had my eyes firmly fixed on the last Steak and Kidney in the shop. However in grabbing the pie the proprietor promptly dropped the pie on the floor. Given that she picked it up quickly and within the ‘3 second rule’ for food being on the floor I said I would eat it anyway. However she wouldn’t take any money for it so this pie was technically of infinite value! 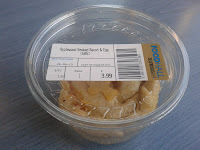 However I am scoring it based on the standard, fairly cheap, price of £1.10. You can see from the picture it was only slightly squashed and certainly better Condition than many pies I have paid for. Upon cutting into this pie there was a delicious thick gravy which stayed in the pie because it had such viscosity. There did seem to be a bit of a lack of meat, with only small pieces being visible. The pastry was nice, however, for some reason there was a bit of an overhang of pastry at the top. This part was a bit dry and, given that this pie was quite shallow, it meant that there was a bit too much pastry compared to filling. Still, this pie was decent value. I was quite excited to find a Hollybush Farm Steak and Ale pie in my local co-op as I had tried one of their Pork & Onion Pies during British Pie Week and found it to be excellent. This pie had a lovely gooey pastry, which was nice and soft and was probably the best pastry in this review. 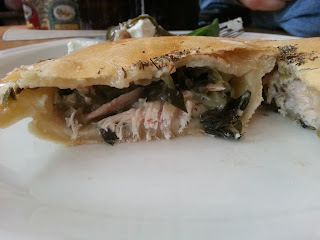 The gravy was also fantastic, lovely and thick, similar to the Jackson's Bakery pie. This pie seemed to be onto a winner if only the meat had been better quality. I found a big piece of gristle in mine and in general it was a bit too chewy. Such a shame. This Chicken & Ham pie was £1.85 from Goulborns in the lovely town of Bungay. It was one of the better ones in this competition because the filling was so nice. The ham must have been smoked because the filling had a very smokey, satisfying taste and was anything but bland. There was plenty of good quality chicken which filled the Capacity without leaving much air space. 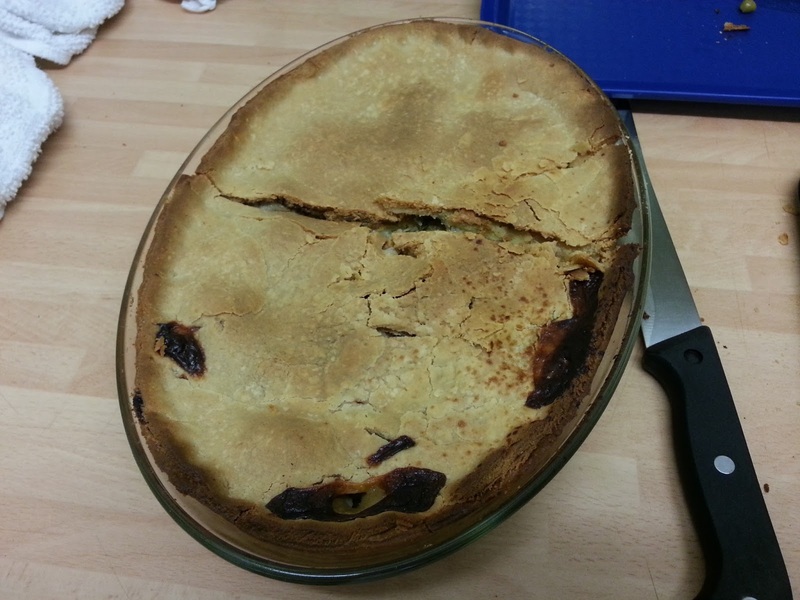 However, what stopped this pie from winning the Suffolk competition was the fact that it was slightly dry. Not a lot of gravy, combined with crunchy pastry stopped it sliding down quite as smoothly as it should have done. 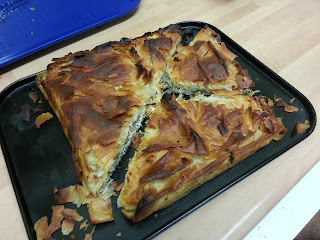 Again, like the Johnson pie there was a bit of an unnecessary overhang of pastry at the top. 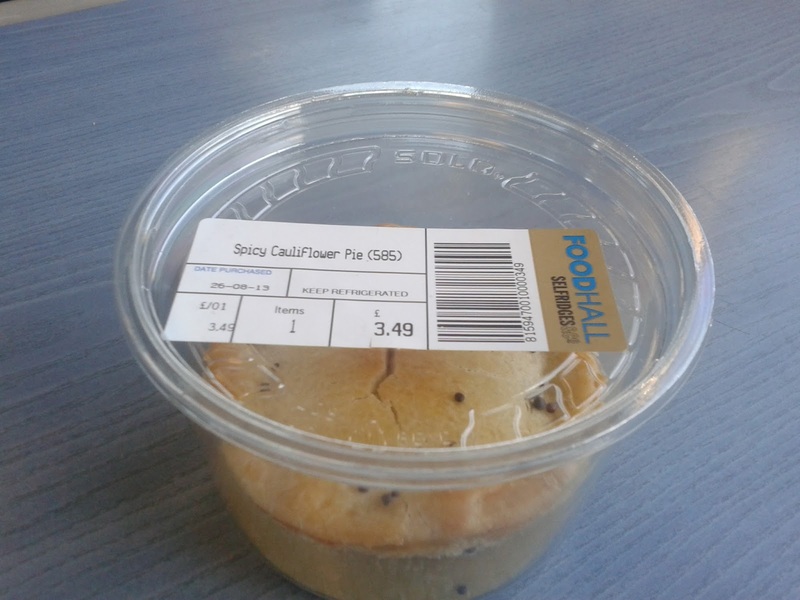 However, it was a good value pie and one I would buy again in a flash. Halesworth is a lovely town which has national cycle route 1 (from Dover to the Shetland Islands) passing right along the high street. This is the perfect place to stop and pick up some pies from the local Butchers C. A. Palmer & Son. One of the great things about pies is that they seem to have cross over between the skills of bakers and butchers and are often available in both. C. A. Palmer pies do actually come frozen in a pack of two for £3. I was a bit sceptical about the fact they were frozen, but then my colleague RAS did find some iced gems in Iceland recently. 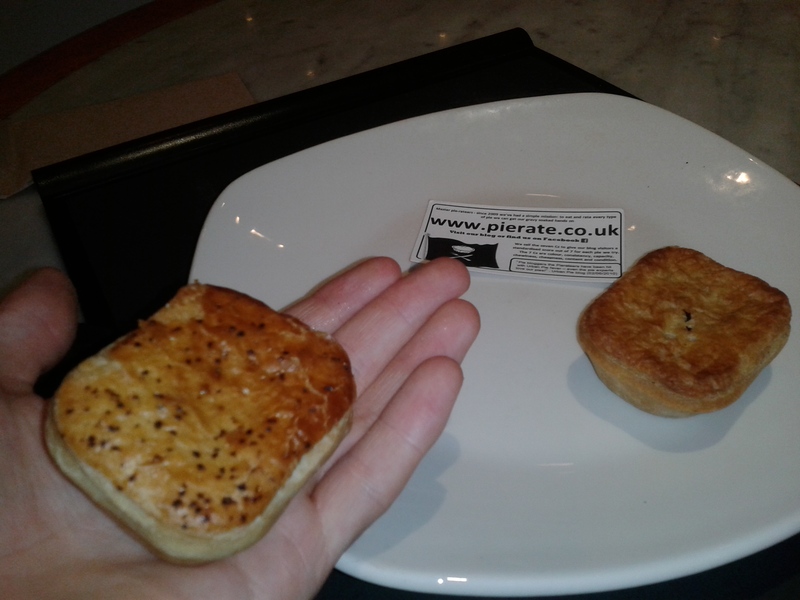 I was reassured by the fact that these pies were advertised as being hand made on the premises. 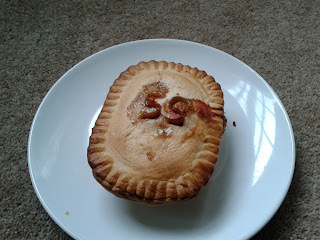 I picked up a couple of Steak & Stilton pies which has a nice ‘SS’ shaped vent which made them look a treat. I was glad that I wasn’t above buying frozen pies because these were excellent . The pastry was (mostly) gooey and soft, the meat tender and the gravy lovely and thick. 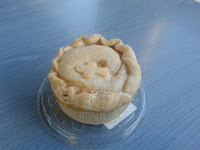 It reminded me of my favourite pie from Kings Farm in Buckinghamshire. I have only minor criticism of this pie which stopped it getting the same kind of score as Kings Farm. Firstly, I couldn’t really taste the Stilton although it still tasted great. Secondly, some of the pastry around the top was a bit dry. This doesn’t stop it from gaining a high score. So the scores in the table below show that C. A. Palmer are the clear winner with a highly recommended and great value pie. This makes them the current Pierate Suffolk Pie Champions. However, the real winner here was pie. There were no pies which were actually bad and it is so good to see so many small pie producers around in Suffolk. If you know of any other small pie producers in the county then let us know by tweeting @Pierateers, they still have the chance to get onto the Suffolk-ate In Pie Leaderboard! 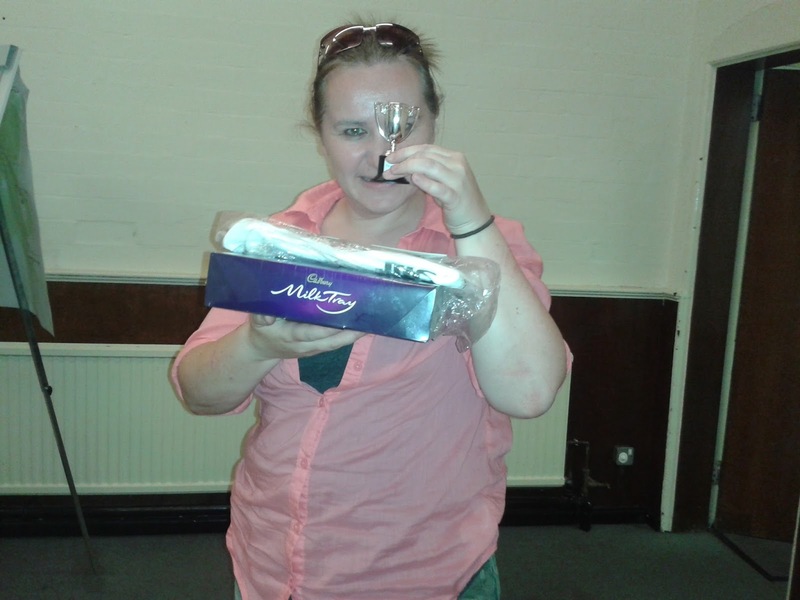 continue reading "Suffolk-ate In Pie Leaderboard"
It’s lovely to receive gifts. And better still, to receive the gift of pie! 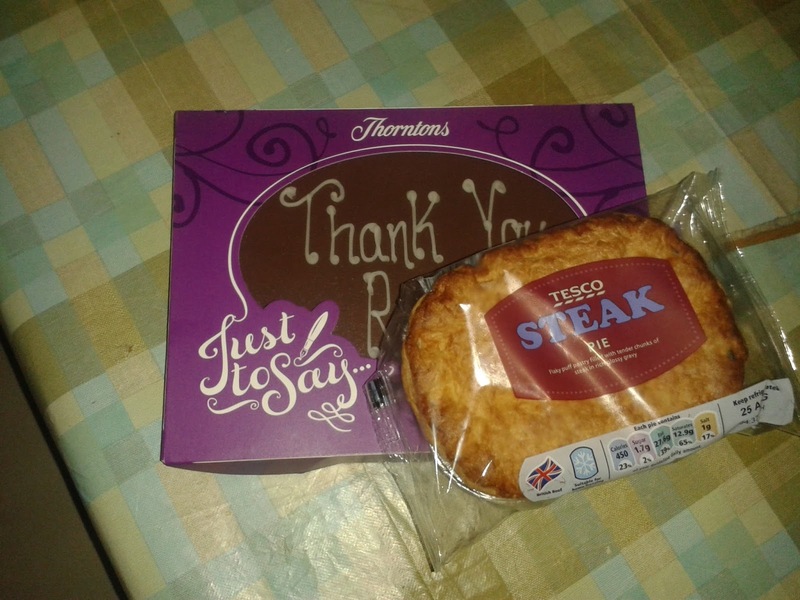 So after a busy period at work, what a delight to find on my desk a thank you card, some chocolate and – most intriguingly – a pie to eat and review, as a thank you for the work I’d done. 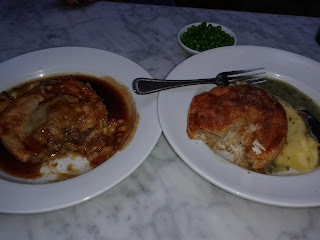 Of course there was a slight catch... my colleagues wanted me to post up the review of the pie ASAP on www.pierate.co.uk! But they know me well enough to know that wouldn’t be a problem! So a big thank you to Anne, Claire, Millie and Rhiannon for the generous pie gift, which was an individual Tesco Steak Pie. The question is, how did the pie rate? Well the pie came out of the oven a dark golden brown colour, with crisp flaky puff pastry on top. 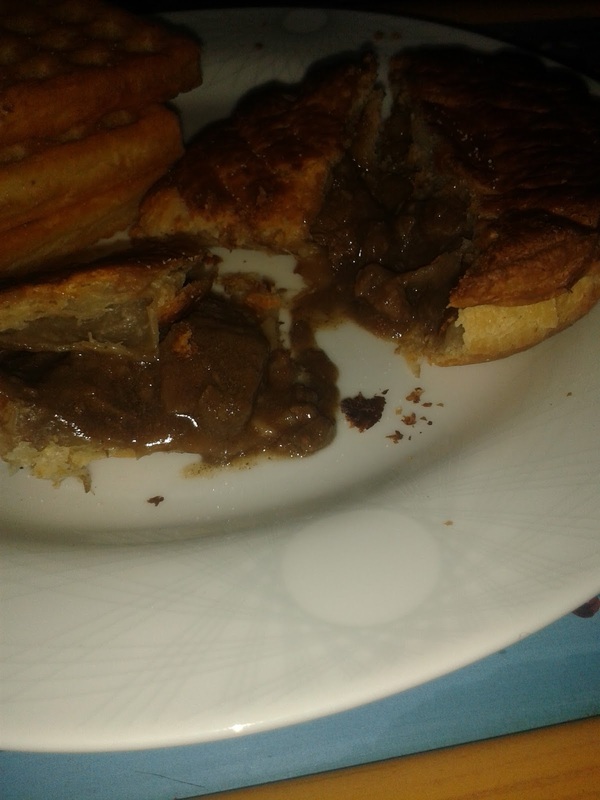 There was a nice crisp cut through the top pastry which highlighted a decent capacity as the steak pieces oozed out of the pie. As quite a shallow pie you would expect a decent capacity – though it would be more pleasing to have a slightly deeper pie – however it was good to see plenty of steak and no other content to pack out the filling. The steak was very tender, which was good to see for a lower cost pie (who often suffer from poorer quality meat), though the steak was a bit chewy in places. The gravy complimented the steak well, though the “rich glossy gravy” quote on the packaging feels a little extravagant for what was provided. The main drawback was a slightly soggy bottom to the pie, detracting from the condition as the short crust pastry was slightly soft. 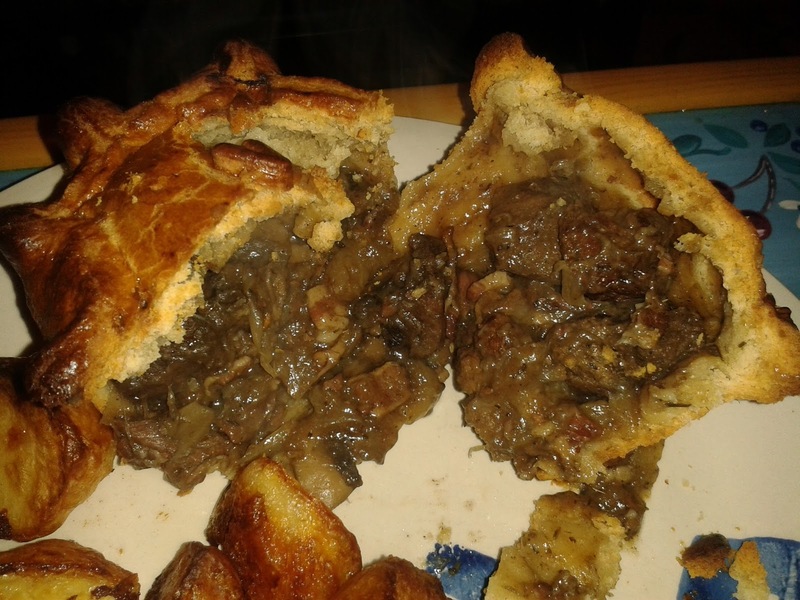 While it didn’t affect the flavour too strongly and meant the pie wasn’t dry (in my opinion, a far worse crime! ), it did let down a rather pleasing value pie. All in all, while too small and shallow to make a proper dinner, this was a decent snack pie at a very decent price (even if paying for it, rather than it being a gift! ), a great little pie gift for your pie loving friends. continue reading "The gift of a Tesco Steak Pie"
continue reading "Not All Pies Are Created Equal"
continue reading "What is a pastilla?" continue reading "Look Mum No Hands!" Pies and Football - They think it's all over... it is now! 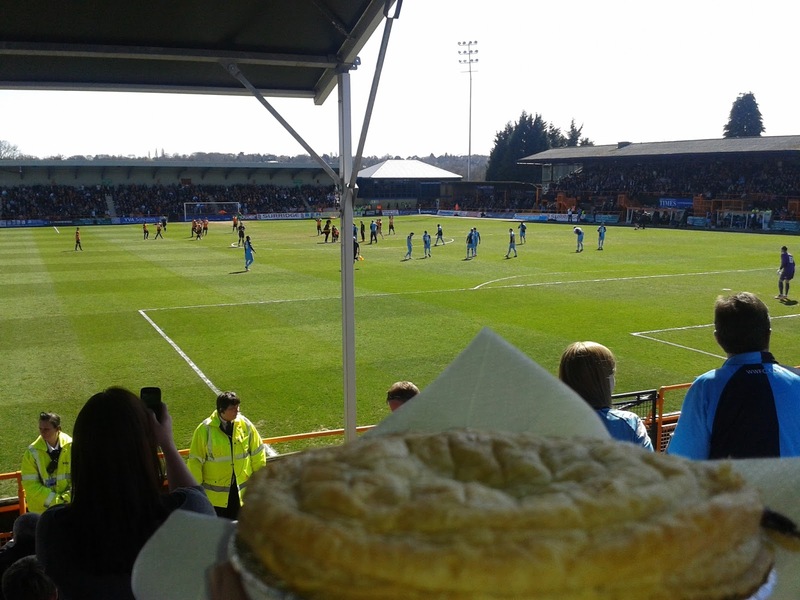 Best Football Pie: A review of pies and football - a match made in heaven! After all, what else do you want to warm your hands and heart during half-time of a mid-winter football league battle than a meat pie? Or any other football match, for that matter! Pies are the staple of a football half-time. 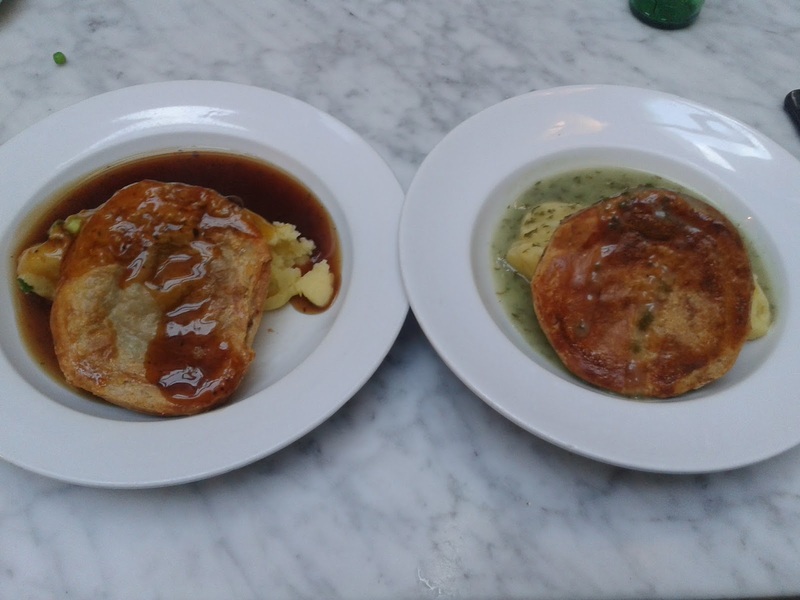 And where else can you start than the definition of half time pies - Pukka Pies. Celebrating 50 Pukka years this year, if 100 people were surveyed on "Name a pie brand you eat at the footie", there would only be one winner. Pukka Pies hit the back of the net every time! They don't break the bank and can be seemingly found in and around most grounds up and down the country, so it's a great effort from all the lads in the Pukka marketing department! But there are plenty of other football pies out there, as our leader board shows, so why not take a look at them? They include the top ranked (making our top 5!) football pies from down at Piebury Corner in London, which not only sell on match days but also have their own pie deli on Holloway Road and Potts' Pies, which football pie expert and author of "92 pies" Mr Tom Dickinson highly recommends, alongside the award winning pies currently sold at Morecambe FC's ground! And who can forget these footie related pie news items? The BBC ran a very interesting article about the true cost of your footie pie - handily summarised in the Half time pie graphic. Or how about Gillingham FC have a pie shaped heart! - showing the only way you can really commend the visiting away fans! Or reminiscing about Portsmouth's financial misfortunes in Pukka Pies await £40 from football club - one of the most bizzare football payments to get in debt over! Whatever you do this coming football season, don't forget your HALF TIME PIE! 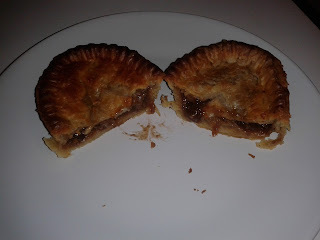 continue reading "Pies and Football - They think it's all over... it is now!" 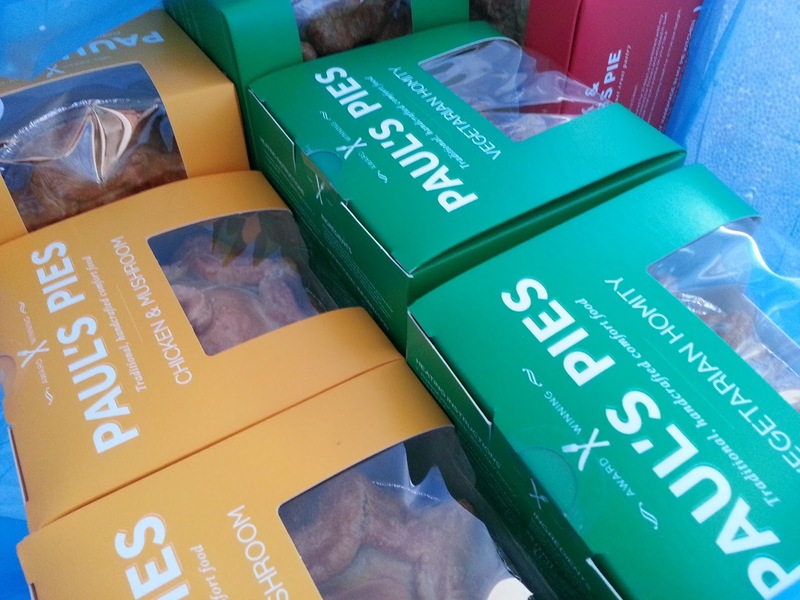 continue reading "It’ll be Paul right on the night – Pierate Pie Contest"
Our mission at Pierate is to find the best pie in the world and promote great pie making. Therefore we like to keep up to date with all the pie contests and pie awards that happen globally. Here is a list of the pie contests that are taking place around the world. If you're holding a pie contest, or know of a pie contest not listed - however big or small - let us know by leaving a comment! This list will be updated as we hear of new contests. This event, run by the Melton Mowbray Pork Pie Association, is one of the biggest in the UK. Their famous definition of a pie is "a filling totally encased in pastry." The awards aim to celebrate the heritage of the British pie. Located in Harry's Bar, Wigan (often seen as the UK pie capital), the World Pie Eating Championships tests how many pies competitors can eat in an allotted time. The contest has been running since 1992. The Hop in Sheffield has held a pie eating contest two years' running, in tribute to British Pie Week. Teams of four compete in a 'pie relay' to eat four pies in the quickest time. The first Pierate Pie Contest was held in Birmingham in July 2013. Following the success of its maiden event, organisers plan to repeat the event again, perhaps in the cooler winter months. Celebrating the traditional Scotch pie, these annual awards attract hundreds of entries. 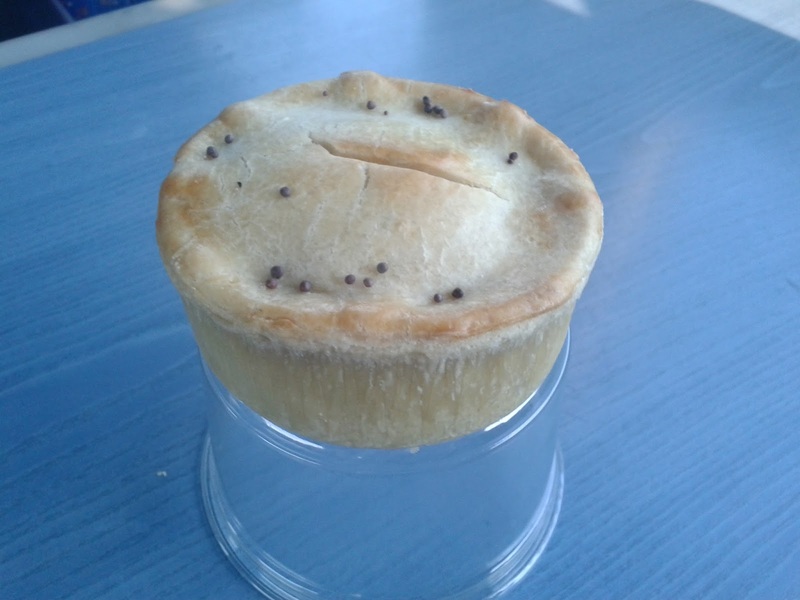 The pie competition is supported by Scottish Bakers and the Scottish Federation of Meat Traders, and the winning pie is crowned the best Scotch pie in the world. These awards are for retail butchers, caterers and pie manufacturers who make steak pies. 2013 will see the 5th KCRW Annual Good Food Pie Contest, held in Los Angeles. "Home cooks and professionals alike will be judged by some of LA's best chefs and food writers - a list that includes Moby as one of the judges." This year there are 7 categories: Fruit, Nut, Cream/Chiffon/Silk, Savory, Vegan, LACMA Art-Inspired Pie and a children's section. This year will be the 9th Annual Bucktown Apple Pie Contest. The contest is a fundraiser for Holstein Park, Chicago. The judges rate the pies according to the following percentages: Appearance: 10%; Filling & Crust 40%; Overall Flavor/Taste: 50%. Only double-crust apple pies allowed. The APC Crisco National Pie Championships take place in Orlando. The event attracts amateur pie makers alongside professional chefs and commercial pie companies from around the country and Canada. Category winners can scoop several thousand dollars. Wayne County Fair, New York state, holds an annual pie contest. Pies are then auctioned off to raise funds for the fair. Northampton Tuesday Market holds an annual pie contest and pie bake sale. Pie Town, New Mexico, holds a pie contest as part of their pie festival. Criteria judged include overall appearance, crust and taste. The Official Great Aussie [previously Meat] Pie Competition is held at alternating locations in Melbourne and Sydney. Run by the Australian Pie Council, the event attracts "thousands of entries" from bakers across Australia. 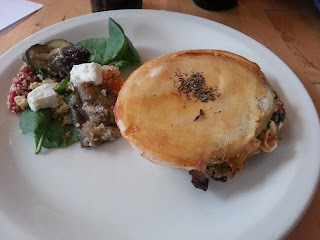 The word "meat" was removed from the title to encompass the gourmet pie category. The 2013 event attracted 4500 entries - the highest number of pies to be entered in the 17 year history of the awards. 19 judges first assess the aesthetics of the pies before whittling down the numbers for the taste-test round. There are 12 categories and an overall supreme winner. continue reading "A list of pie contests around the world"
continue reading "Birmingham's Best Pie Recipes - Pierate Pie Contest"
The pies of the first ever Pierate Pie Contest. Following the pie contest overview, this post references the pies and inaugural Pierate Pie Contest winner! Having enjoyed a hearty pie dinner thanks to the delicious Paul’s Pies sent to us for the main course, it was time for the actual pie contest itself to begin! Pierateer TJP had already gone through the 7 Cs marking criteria with the pie contest guests and so we were ready to crack on with the pies! 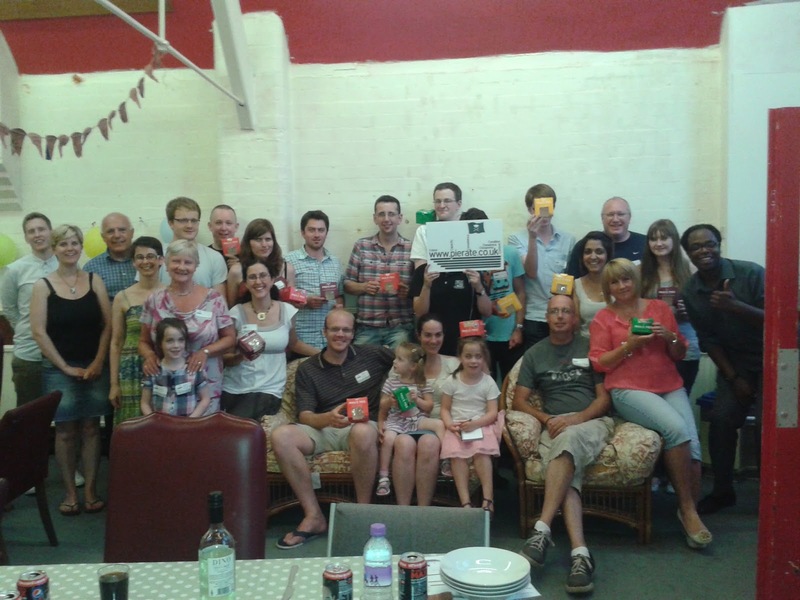 Who would win the Pierate People’s Choice Pie Award 2013? 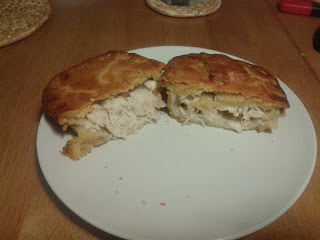 The first to be eaten were the “Meatless Masterpiece Pie” (which was impressively gluten free as well as vegetarian, to cater for specific diets) by Victoria and the Ogborne’s Chicken and Leek pie. Both made a good first impression on the pie diners. This was followed by two shop-bought pork pies eaten cold, namely the “Cheesy Pig” (Pork and Stilton) and Pat’s Pork Pie. 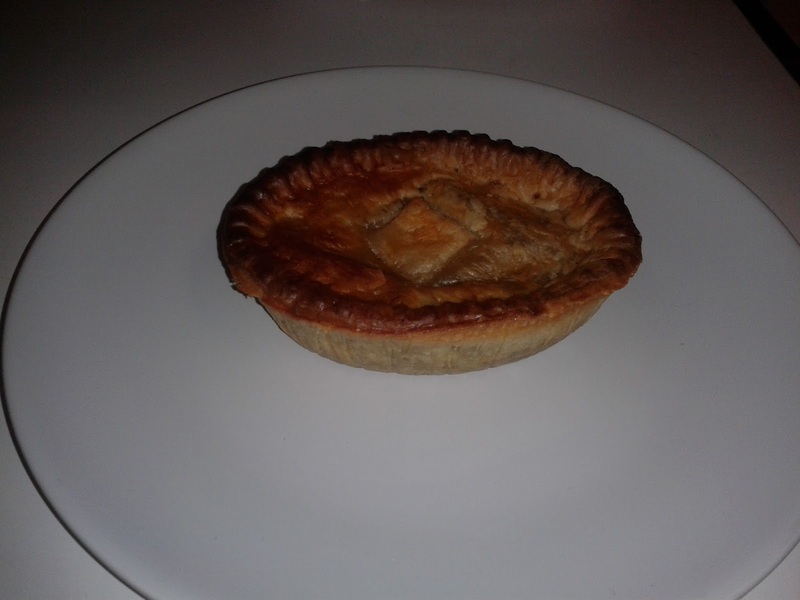 Pat’s Pork Pie got a very decent score of 5.75/7 to win the accolade of best shop bought pie. We Pierateers will have to try and get our hands on this pie for a proper full review one day! The wild pies came out next, produced by the Pierateers themselves and with quite an unbeknown quantity to them. The first was the “Springbok ‘n’ roll pie”, which as the name suggests included pieces of Springbok meat alongside the more traditional mixed vegetables and chicken gravy. Following that came the “Beast from the East (side of Africa) pie”, which of course contained Wildebeest meat alongside sweet potato, mix vegetables and beef gravy. 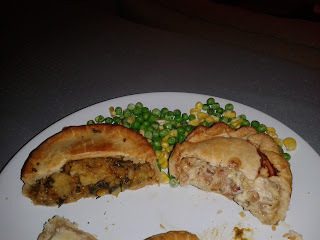 These were certainly the first times that we are aware these two flavours of pie have been eaten and reviewed! The meat was purchased from www.exoticmeats.co.uk and both received quite mixed score reviews, with the Springbok edging things with a 5.17/7 average (but the only 7/7 of the whole evening!) compared to the Wildebeest scoring 4.79/7. Pierateer RAS was pretty pleased with that effort considering he is certainly more of a pie eater than pie maker! As for the taste, the Wildebeest was strongly beef-like but not overly chewy with Springbok a bit lighter and more gamey. Certainly not as rich as venison (as a deer comparison) and not as beef-like but still within that meaty area! These were followed by a filo pastry “Spinach and Goats Cheese pie” by “Chrissy the Terrible” and “Kevlaaarrgh” providing a “Poacher’s Pie” (Sausage and Leek). As well as putting in the effort with good Pirate names, they had clearly put in the effort in preparing the pies with two top scoring efforts which went down well with the pie contest guests. A Beef and Sweet Potato pie by Mr Harvey – highly commended for its free-standing full encasement of pastry (i.e. without the support of a pie dish) – and potato topped Gammon and Leek Pie by Gloria rounded off the savoury pie selection. 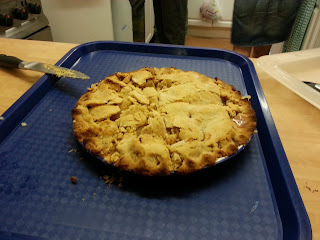 The homemade sweet pie of the evening was provided by the Niclasens (and I am told the children handpicked the apples to go in it, so a real family effort!) and was a strong contender come the final scores. 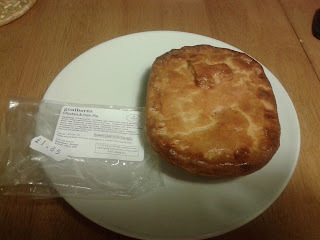 The night was rounded off with a couple of shop bought sweet pies – namely the Sainsbury’s Bramley Apple Pie (reviewed on this blog previously) and a Becketts Farm Blackberry and Apple Pie. In summary: 13 pies, 11 hot, 2 cold, 8 savoury, 3 sweet, 1 epic pie night! Thanks so much to everyone who took part, particularly those who entered homemade pies which truely had stars in their pies! 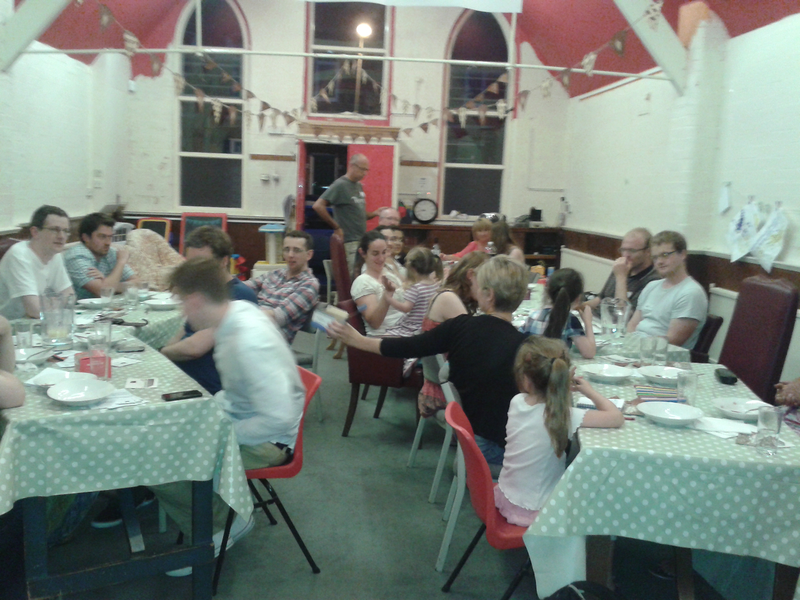 But whether baking, eating or scoring pies, it was a great night and we hope to one day do it all again! 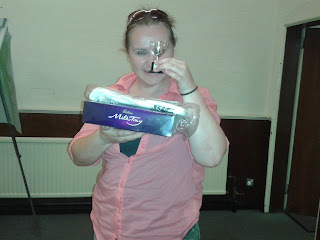 And arrrgh winner is... "Chrissy the Terrible"
continue reading "Stars in their pies! - Pierate Pie Contest"
continue reading "We ate all the pies! - Pierate Pie Contest"